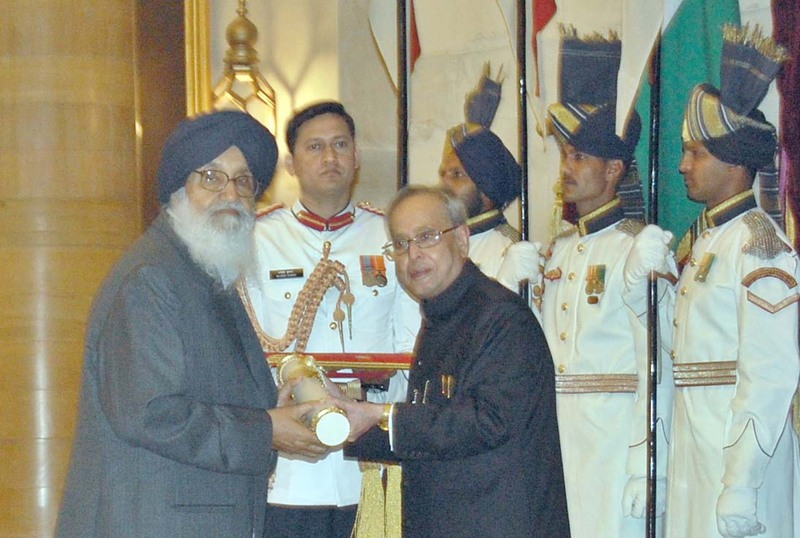 New Delhi : President of India Mr. Pranab Mukherjee today conferred the coveted Padma Vibhushan Award to the Punjab Chief Minister Mr. Parkash Singh Badal at a Civil Investiture Ceremony held in Rashtrapati Bhavan this morning. Disclosing this here today a spokesperson of the Chief Minister’s Office said that Sardar Badal was given the award by the President in the presence of Vice President of India Dr. Hameed Ansari and Prime Minister Mr. Narendra Modi besides several Union Ministers. The citation of the Chief Minister presented on this occasion reads as “Sardar Parkash Singh Badal is an Indian politician, who has been the Chief Minister of Punjab for four terms previously – from 1969-71, 1977-80, 1997-2002, 2007-2012 and is currently the Chief Minister of the state for the fifth term. Few in this country can claim to have remained in the forefront of public life for almost the entire period of the post-Independence India as he has been, making him the grand patriarch on the Indian political scene. Born on December 8, 1927 in village Abul Khurana, Sardar Badal did his graduation from FC College Lahore. He entered politics in 1947 and became the Sarpanch of his village. He was elected to the state legislative assembly first in 1957. He was re-elected to Vidhan Sabha in 1969. He served as the Minister for Community Development, Panchayati Raj, Dairy, Fisheries and Animal Husbandry. He was the Chief Minister of Punjab for four terms previously – from 1969-71, 1977-80, 1997-2002, 2007-2012 and is currently the Chief Minister of the state for fifth term. He has been a Member of Parliament and has served the position of the Union Minister of Agriculture and Irrigation in the Union Government headed by late Shri Morarji Desai in 1977. Sardar Badal’s contributions towards the welfare of people of Punjab have been enormous. Apart from carrying out various welfare services, he has contributed in the upliftment of the society and states, introducing various welfare schemes that has benefitted his state largely. His life is a saga of struggle for safeguarding human rights, civil liberties, freedom of the press and other democratic values in the country. He has spent the better part of the prime of his life in prison fighting for popular causes in independent India. Throughout his life, he has championed the cause of the poor and the underprivileged people, especially the poor peasantry and landless labourers. He has been beacon-light of peace and communal harmony in society, emerging as a strong voice of sanity and humane values. Completing more than half a century in political life, Sardar Badal has worked consistently for the establishment of a genuinely federal structure in the country. All his life, Sardar Badal has worked closely with the common people, earning him the well deserved sobriquet of “Man of the Masses” and a true grass-root leader. Even today at the age of 86 years, he regularly holds Sangat Darshans in villages across Punjab by going to the doorsteps of the people to redress their grievances. His contribution to the cause of his state has been phenomenal indeed. Sardar Badal has numerous awards and coveted honours to his credit for distinguished services and life time achievements. However, the most revered honor bestowed upon him was the legendary title of ‘Panth Rattan Faqhr-e-Quam’ from Sri Akal Takhat Sahib in recognition of his outstanding contribution and glorious services rendered by him during his long Panthic and political career”. On the occasion, the Chief Minister was accompanied by Deputy Chief Minister Mr. Sukhbir Singh Badal and Union Food Processing Minister Mrs. Harsimrat Kaur Badal.